When the world is too small, and all the available space is already taken by bullies, bastards, and other things starting with B, then what are your options? Not many, as it turns out, you can either go up, or down. And since the gnomes are not making any progress on airship technology, you better get a shovel. And then you arrive in the Underground, and you find that nothing is better down here, the world is still one big contest of who’s the biggest bully. Welcome to Small World Underground. If you know the original Small World, also by Philippe Keyaerts, then you will immediately know your way around Underground. There are some new things, but the basics are the same. Only, you know, with less sunlight, more cold, more moist and those giant-eyed albino lizards staring at you from the ceiling. So you will not find much new in the following two paragraphs – after that, you may want to have a look again. Small World and Underground both follow the easiest imaginable set of rules for world conquest: if you can march into a region of the board with enough troops, it’s yours. 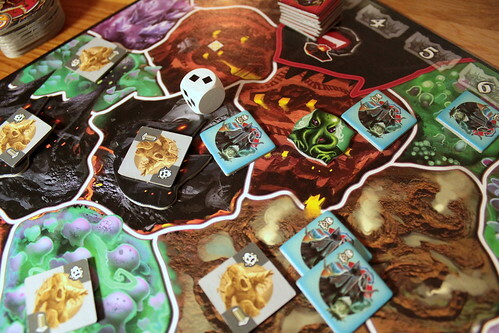 Enough troops means: two for an empty region, plus one for each monster or opponents’ unit plus one more for some other obstacles that may be on the board. All former inhabitants are then forcibly evicted from their ancient homeland – which they probably only conquered last round – and you are free to find new places to conquer. It’s that easy, not even dice are involved except on the last conquest for your turn where you may roll a dice and try to annex an extra region without sufficient troops but the help of one die. The only thing limiting is you is the availability of troops: it depends on your chosen race and special ability and ranges from 8 to 15. Not all that much, considering how many you need. That’s why your guys racial and special abilities are so important they are one of the cool things in all the Small Worlds: races and special powers are randomly put together, giving you new combinations every time you play. 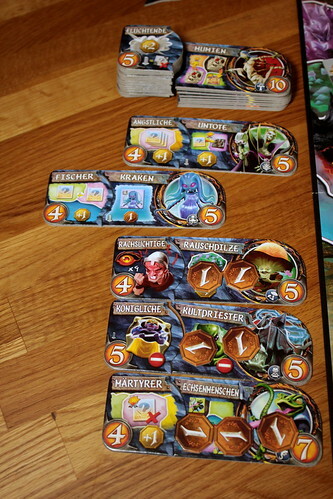 For example, the Ogres, who are already big, strong, and ugly and need one token less to conquer any region, may be Fisher Ogres in one game and gain extra points for regions adjacent to the river, and Vengeful Ogres in the next, requiring even less tokens to beat down an opponent that attacked you on their turn. The different race/power combinations are pretty cool already, but what is even cooler is that you’re not limited to one of them per game: when you feel that your current race has reached the peak of its development, you can simply abandon them, send them into decline and pick a new one on your next turn. Picking a new race works the same as picking your starting race: six combinations are always available to choose from. The one on the bottom of the list is free, to pick any other race you have to place one coin – meaning victory point – on every race below. That way, the less desirable combinations become more attractive over time. Speaking of the victory coins, you get them at the end of your turn, for every region you control, plus bonuses depending on your race and power. The interesting part here is that your races in decline still give you points on every turn, until someone wipes them of the map. Going into decline while you’re in a strong position can thus pay off big time, especially if you can protect the declining regions with your new chosen people. Except for different races and powers, this is all like regular Small World. Now here’s the part where Small World veterans want to start reading again. Before the game starts, certain regions are seeded with monsters to defeat. Those guys are nothing special in themselves, you whoop them when you move into their territory and remove them from the board. But when you do, they leave behind a random Righteous Relic or Popular Place. Both things confer big benefits to whoever controls them, the main difference is that Relics can be moved around the board while Places stay put. To give you an idea how powerful those effects may be, here are some examples: the Stinking Troll Sock lets its controller conquer one region as if it was empty, the Flying Doormat lets you treat any region on the board as adjacent to your territory – both once per turn only. On the Places side of things, you have The Altar of Souls where you can sacrifice your declining forebears for victory points, or the Wickedest Pentacle that summons a Balrog under your control, a giant monstrosity that can completely obliterate everything in one region and make it ready for you to take over. With those effects and more of the same magnitude, it’s no wonder they are called Popular Places. But the Places and Relics to dome than just smite your enemies, they also add more points of interest to Small World, a game that already didn’t lack things you have to consider on the board. Now it’s not only your bonus score to consider in where you go and your abilities in how you get there, you also have to think about those new elements – when are they useless, when are they helpful, and when do they let you kick an opponent in the teeth that seemed impossible to reach without them. Even going into decline becomes a little bit more interesting thanks to Places and Relics, because handing them over from your current race to the next is not always easy. So everything that was cool about Small World is still there, but then there is some new stuff that is also cool. 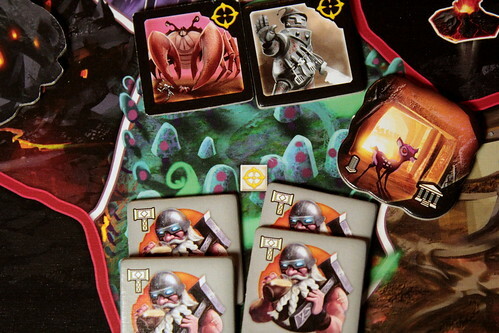 If you don’t have any Small World yet but really wanted one of them, then Small World Underground is the way to go: it comes with the extra stuff, but you can leave it out and play the basic variant as well, except with different races. And one Small World is definitely a game to have in your collection, it’s light on the rules – at least as strategy games go – and a lot of fun to play. If you already own the original Small World, then it’s not a waste of money to get Underground as well, the races and powers from one mostly work in the other and you can turn up the replayability a lot. However, to get more out of your old Small World, you’d probably be better served with the expansion Small World Realms with its modular game board and game scenarios.